Buttressed effectively but the foundations need work. Ah, the holy land. That sacred place where people of all faiths have convened to massacre each other in the name of the same god since the year dot. A particularly fine example of said internecine monotheism was the long period of the Crusades, when a load of nobles wearing steel onesies were pressure-cooked in the sun whilst hundreds of servants died killing the distressed locals in spectacular sieges. It's a great period for the Stronghold series to return to. The original isometric Stronghold Crusader was released way back in 2002, a year after Stronghold, and both were very well-received. This sequel follows that first title slavishly, moving the conflict from SC3's medieval Europe to the sandpit of the Middle East, and reintroducing many of the features that made the first game such a success - a load of fun new units as mercenaries, skirmish-based campaigns against AI enemies with personalities, and a whole lot of sand. The difference is that it's inherited the troubled and plain-looking 3D engine from 2011's Stronghold 3. The worry is that it's also inherited that game's bugs and tedium. A simple tutorial and two short campaigns introduce the game mechanics, after which the great majority of your time is spent in skirmishes or following set-piece battle campaigns. These mostly take the same path - build your economy, then build your castles, then send out troops to attack your enemy, devastate their defences and kill their lord(s). All RTSes are, to some degree, resource-juggling games. Learning the optimal SC2 resource build takes a few tries, but crucially there is an optimal tree - literally, as without wood everything grinds to a halt. Other resources can be fudged, as you can feed your peasants less or lower taxes or even buy rare goods in, but your economy runs on wood. It's a pity then that the rudimentary UI hardly tells you anything about what goods you have or when they're under attack. The map is similarly useless, just showing big castle icons. Castle-building is the great pleasure of the game. Heaping up great mounds of stone into towers gives your archers additional range and protection, and you can make some truly spectacular castles. 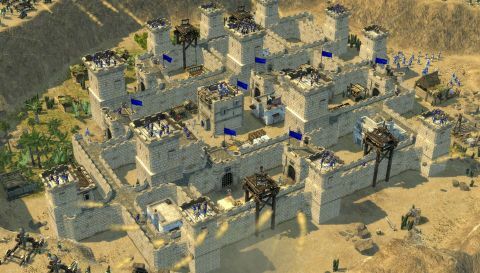 Sieges can be fun too, as you carefully position your siege engines to whittle down opponents' walls, and watch them collapse satisfyingly. It's odd that you can only build castles in arbitrary squares on the map, however. The actual combat is classic scissors-paper-stone stuff. Neither your troops nor the enemy's are particularly smart, so battles require a lot of micromanagement. The variety of new units is welcome, from dervishes to slave-drivers, though archers trump everything else, due to how cheap they are and their massive range. Firefly has resolved a couple of PCG's problems with Stronghold 3. Defenders now benefit from castle defenves. Archers will now attack enemies on the walls. Yet many other bugs are still there. Too many times, the troops who should have been peppering my enemies with shots were hidden in walls by crappy pathfinding. Too many times, I had to delete those walls and lose literal tons of stone. And oddly, I could insta-repair those walls whilst they were under catapult fire, because enemy units have to be closer than their range to interfere with repairs. Additionally, the final section of every battle, where you kill the enemy lord stood atop his keep, is horribly protracted. For some reason, his keep is indestructible, siege weapons pass right through him and it, and arrows mostly bounce off. Other units don't seem to work at all; for example, every time I tried to use a flame cart, it would just explode on the spot. Like castles, great games needs strong foundations. The core problem with the new Stronghold games appears to be that the engine isn't fit for purpose. These castle blocks don't want to sit in or on the smooth terrain and bugs are regular. The position detection is still poor - it often takes multiple clicks to repair a castle wall, and targeting the right castle section with a catapult can be tricky. Sometimes I suspect there's no collision-detection at all, meaning troops just pile up in a spot. And the poor UI compounds the problem. The Stronghold series isn't like Total War, doing a hundred different things; it just needs to get the castles and combat right. On the evidence of Stronghold Crusader 2, Firefly is moving in the right direction, but it still has a way to go.